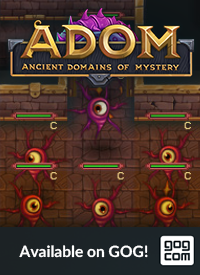 The Official Blog for ADOM (Ancient Domains Of Mystery): ADOM 3.2.0 released as a Steam beta! 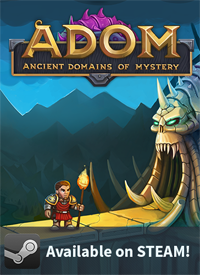 We are proud to finally announce the release of ADOM 3.2.0 as a Steam beta version (follow this link to read how to activate a Steam beta). 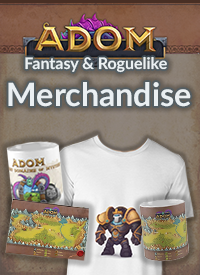 The central new feature of ADOM 3.2.0 is a high personalization and customization level of the PC sprite. Hair color, armor, weapon type, etc. now will show. There are still tons of detail we have to add but the amount of variety already now has been mind-staggering. So enjoy the first release of this feature, let us know what you think and we will work on improving it. The brief changelog can be found in the usual place. First of all - you all did amazing job! There is no words to describe how long I've been waiting for this! Congratulations! But I have a question - will there be manual customization? Random look can be...how do I put it...messy? Almost got a heart attack when saw my pink haired troll woman. I have as well, and it is currently random. It is beta, so I do hope some way customize comes. ...and I do hope better elven face are coming too. IMHO current faces looks terrible.